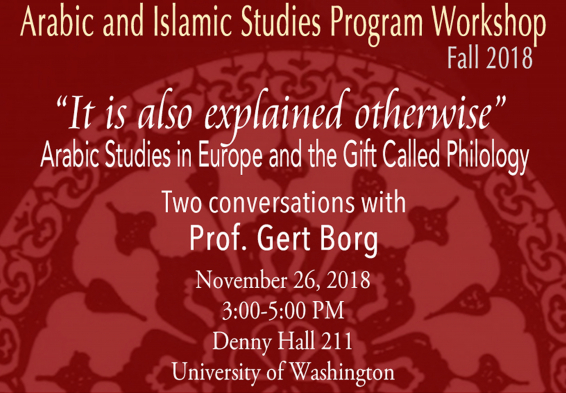 Arabic Studies in Europe and "Gift Called Philology"
Monday, Nov. 26, 2018, 3 – 5 p.m. Professor Gert Borg will talk on the current state of Arabic Studies in Eurpoe through a discussion of Thomas Bauer's , Die Kultur der Ambiguit¨at, Eine andere Geschichte des Islams. Berlin: Verlag der Weltreligionen (2011) which refreshed discussions around the question of spread of Islam. As summed up by Prof. Borg in his review of this book (MESA RoMES, 51:1, 2017), Bauer argues in his work that an acceptance of ambiguity by the collectors of Qur'anic text and hadith brought about an openness and frankness, not only in scholarly studies, but also in other domains of life. Bauer focuses on two, Arabic poetry and realm of sexuality. Prof. Borg will communicate the discussions and debates around Bauer's work and then the talk will continue with a discussion on the state of philology in European studies on Arabic. Prof. Gert Borg is a Professor of Arabic and Islam Studies at the Radboud University in Netherlands. His research is in the field of Classical Arabic poetry as it is related to the birth of Islam and the ideas and concepts of the first converts. He also works on 10th century poets who lived in Arab Sicily. This is a free event organized by Arab and Islamic Studies Program and open to faculty, students and interested community members.